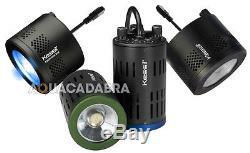 KESSIL LED A160WE A360WE LIGHT MARINE FISH TANK LIGHTING TUNA SUN WHITE BLUE WE. Please use the drop-down menu to select your preferred size. The following options are available from Aquacadabra. E-Series LED - New E-Series LEDs are 15% brighter with the same wattage consumption, resulting in even better penetration and more intense shimmer. Shimmer - Beautiful, unrivaled shimmer gives the look of natural sunlight in your aquatic garden. Spectrum - Kessil is the only company to manufacture all LED arrays in-house with custom spectral blends specifically tailored to meet aquarist needs. Double Peak - Leveraging years of Kessil's own grow light research, our LEDs now emit a "Double Peak" spectrum, which improves plant colour and growth by enhancing photosynthetic absorption. Penetration - Patented Dense Matrix LED technology concentrates multiple LED chips into an array, creating a powerful light source with better and deeper penetration, without sacrificing coverage. Colour Mixing - Different wavelengths within a single LED array are seamlessly blended before leaving the light, emitting a uniform colour with widespread coverage. Design - High performance and low maintenance. Simple and compact units feature quiet operation, innovative heat management and efficient, long-lasting LED construction. Kessil Logic - Tune the spectrum and intensity for a personalized look. Kessil Logic maintains consistent output across the spectrum. Controllable - Compatible with 010V external controllers. Daisy-chain multiple lights for seamless control from a single source. Dimensions 3.8" x 4". Coverage Up to 24 surface diameter. Power Supply 100-240V AC (input), 19V DC (output). Kessil Logic - Kessil Logic enables near equal intensity across all spectral points from Sky Blue to Deep Ocean Blue and everything in-between. The Kessil A360 is certified by Neptune Systems as Apex Ready+, and is compatible with many 010V external controllers. Shimmer - Beautiful shimmering effect gives your tank a natural, sunlit look rivaling MH. It's like connecting with your own piece of the ocean. Tunable Spectrum - Select the spectral point you prefer with full confidence your corals are getting what they need for optimal growth and colour. Colour Mixing - Dense Matrix LED technology blends different light wavelengths before they leave the light, providing uniform colour throughout the tank. Single light source eliminates spotlight effect, spreading powerful light over a wide area. No matter which spectral point is chosen with the tunable spectrum, proprietary blend of precision UV light encourages coral colour. Design - Different models let you decide between maximum penetration or maximum coverage area. Engineered for long life, quiet operation, efficient cooling and maximum performance, all in a compact, low maintenance and attractive design. Controllability - On/off timing, intensity and spectrum are adjustable either manually or with a 010V external controller. Lights can also be daisy-chained so adjustments to one light control all others. LED 90W DEX 5000 LED. Fixture Dimensions 3.8" x 4" (Length x Diameter). A360W: 24 surface diameter by 3' penetration (on average). Power Supply 100-240 VAC (Input), 48 VDC, 1.87A (Output). Brand new is the A160WE freshwater Tuna Sun perfect for plant growth. The A160 has the same small size and gooseneck compatibility as the previous 150 model, but also all the on-board controllability of the larger A360 model, while at the same time being new Spectral Controller compatible. Kessil marine lights include the all-important UV spectrum built into the Dense Matrix Array, so provide the light that corals really need as well as providing eye-catching, popping colours. Being pendant, point source lights, the shimmer effect is unrivalled. Sleek - 40W - Tuneable Light. Tuna Sun - 6,000K - 9,000K. Dimensions - 4" x 2.48". Coverage - Up to 24 surface diameter. Power Supply - 100-240V AC (input) 19-24V DC (output). Brand new is the A160WE Tuna Blue. Tuna Blue - 10,000K Actinic. Kessil's A Series Gooseneck is a versatile mounting option that allows you to customize the positioning of your light. Designed to be used on most glass tanks, its 24 in. Malleable but sturdy arm provides a strong, adaptable solution to install your Kessil aquarium light. Length 6' (1.8m) without connectors. Plug types 1/8" (3.5mm) stereo male phono plug to 1/8" (3.5mm). Intuitive and affordable light control equipped with flawless touch control and a vivid colour display, the spectral controller is effortless light control at the touch of your fingertips. Its straightforward approach to light control programming allows for endless customization options without the confusion. The sleek, modern design ensures a beautiful and cohesive setup that won't disrupt the look of your aquarium. One controller, two ports each controller is equipped with two separate 0-10v-output ports. Each port can control its own independent set of lights; whether it's two groups of lights on one aquarium, a display and refugium, or multiple tanks, a single controller links it all together. Program mode features two ways of setting a customized light schedule to match individual tank needs. Quick set: create unique dawn and dusk effects by altering light intensity and color throughout six different time points. Acclimation mode: simplify the introduction of new lights to a tank or new corals to an existing setup with acclimation mode. The acclimation timeline can be customized to suit specific needs. Manual mode instantly tune spectrum and intensity for on demand light customization. Compatibility the spectral controller is compatible with the entire a360 line, a160 line, and future products. Connector cable between external controller and A360N/360W. Plug Types 1/8 (3.5mm) stereo male phono plug to RJ45 plug. KESSIL CONTROL EXTENSION LINK CABLE. Extender cable for either between lights or between controller and light. Plug Types 1/8" (3.5mm) stereo male phono plug to 1/8" (3.5mm) stereo female phono jack. The adapter is designed to be used with the A Series Gooseneck and allow the customer to gain additional reach for larger aquariums. The Adapter can install in less than 1 minute to an existing light and A Series Gooseneck combo. The 90 Degree Gooseneck Adapter will allow you to display your lights in a unique way that adds a new level of fit and finish to the already popular A Series Gooseneck. Compatible with A-Series Gooseneck Only. For all your aquatic, reptile & other pet needs! Also post-codes AB 30-38 and AB 44-56, FK 17-21, G83, IV 1-29 IV 30-32 and IV 33-39, KA 27-28, KW 15-99, PA 20-99 PH 17-32 and PH34-38, PH 33, PH 49-99, TR 21-25 AND ALL ZE POST-CODES. Unfortunately couriers pass on aditional shiping charges for these locations which we have to pass on. There are many reasons to shop online with Aquacadabra. Having traded online for so many years, we were one of the original specialist online aquatic retailers. As such, we have a huge wealth of experience in online trading. Open six days a week and staffed by experienced aquarists with a love for the hobby, our staff don't just manage the welfare of our live stock on site, many also have tropical and marine aquariums at home. It is only by being enthusiasts for the hobby that a true understanding of fish husbandry can be obtained, whether it is understanding the requirements of your fish or knowing the appropriate piece of equipment that you require to succeed in the hobby. Our experience in store and at home allows us to provide expert advice when ever required, so feel free to get in touch, you're most welcome? Link that can be found on every product page. One final reason to shop with Aquacadabra is our inventory. When placing an order with us, you can rest assured we'll have the goods with you as quickly as we possibly can. We feel that offering a large inventory of products at competitive prices, tied to a high level of customer service and the reassurance that we are available for you 6 days a week for any fishy questions that you may have, Aquacadabra is the one stop shop for all of your aquatic reptile or pet needs. Our website features an extensive online Help section which covers all eventualities with orders; together with easy to complete forms to enable us to address any problems in as quick an efficient a time frame as possible. The item should be in an unopened and unused condition and you should notify us within 14 days that you wish to return the item to us. Please be aware that after bank holidays there is always a back log of orders for us to work through. Usually this is due to a courier being unable to locate an address, and unfortunately problems can from time to time be encountered when using any third party courier service. Please note that should a parcel be lost it takes 14 days before we can claim for the lost parcel. We will discuss the matter directly with you to ensure that you receive the minimum of inconvenience. Please do not send any faulty items to us directly as this may cause a significant delay in resolving the matter. Once an order has been placed it will be processed almost immediately. This means if you wish to cancel the order you will need to send the goods back to us once received. This listing is currently undergoing maintenance, we apologise for any inconvenience caused. The item "KESSIL LED A160WE A360WE LIGHT MARINE FISH TANK LIGHTING TUNA SUN WHITE BLUE WE" is in sale since Wednesday, January 21, 2015. This item is in the category "Pet Supplies\Fish & Aquarium\Lighting & Hoods". The seller is "aquacadabra" and is located in bexleyheath,kent. This item can be shipped to United Kingdom, to Austria, to Belgium, BG, HR, CY, CZ, DK, EE, FI, to France, to Germany, GR, HU, to Ireland, to Italy, LV, LT, LU, MT, to Netherlands, PL, PT, RO, SK, SI, to Spain, SE, to Australia, to United States, RU, to Canada, to Japan, to New Zealand, to China, IL, to Hong Kong, NO, ID, MY, to Mexico, SG, KR, to Switzerland, to Taiwan, TH.